Our series focusing some of the Rochester area's most fabulous women continues this week with Sheryn Kelderhouse, owner of Vintage Bliss in Webster. A: First and foremost I am a mom to three amazing kids- Zack 20, Nicollette 17, and Will 6 yrs. old. I am also a wife and a creative spirit with big dreams!! I love creating, especially taking old discarded things and giving them a new life as something completely different. Another passion of mine is inspiring others to live their dreams and make the most of what they have to offer. Our purpose should be fulfilled. Q: I just love Vintage Bliss. It's a joy to come into your shop because it feels so welcoming. You can tell you love what you do. What do you love most about your shop and your business itself? A: There are so many things I love about my shop. I love the cozy cottage I am in and the fact that its something I have wanted to do for a long time and in about 2 weeks just made the decision to go for it! I also love all the great people I have reconnected with through my shop, like yourself, and all the new people I am meeting every day. Q: When I met you many years ago (just over 10, to be exact), I was in my early 20s working for Lancome and you were working at my counter with little kids at home. How we both have changed! What prompted you to head in a different path? A: I have always been one who has tried many different jobs in my life from flight attendant, Director of Catering for hotels throughout the country, Lancome counter sales, to interior design, searching for the one thing that would become my passion. I was fortunate enough that in my mid 30's I was able to find what that was and to be living it now and realizing that this is just the beginning and knowing all that I can accomplish that is still to come with this is so exciting. Q: Have you always lived in this area? What do you love about Rochester? A: I was raised primarily in Fairport, but once I graduated I spent years away at college and living throughout the country before returning here. I do not like the weather here in Rochester but I love the fact that my whole family and my husband's family live here or within an hour because we all spend alot of time together. I also think Rochester is a great creative community and has so much to offer in the arts . Q: Favorite restaurant in Rochester? A: This is actually a tough one because my husband and young son like to say they are "buffet people" , and my two older kids father and family own Pasta Villa, which is an amazing restaurant (Karley's note-this is right across from Rubino's here in Irondequoit. It's a great place). However, we hardly ever go out to eat with our busy schedules so I am going to have to plead the fifth on this one. Q: If you had a completely free day, where would you head? A: If I had a free day I would probably head out towards some lake towns shopping for treasures and enjoying the sound and smell of the water. If the weather wasn't great though you would definitely find me with a coffee at Barnes and Noble for the whole day just browsing, reading, writing, creating!!! Definitely one of my favorite spots! Q: Beyond your business, what are your hobbies and other interests? A: I love to read, all kinds of books and magazines! I enjoy shopping with my daughter, absolutely LOVE watching professional tennis with my older son Zack, and hanging outside with my husband Peter and son Will while they play together. All of the above makes me very happy, I am blessed! Thanks to Sheryn for her time! 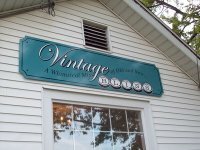 If you live in the area and have not yet visited Vintage Bliss, you must head that way! It's located at 30 North Avenue (Route 250) in Webster. If you're headed from my part of the area in Irondequoit, get on 104 and head east. Exit at Route 250 and turn right at the light. Vintage Bliss is just past Dunking Donuts on the right.